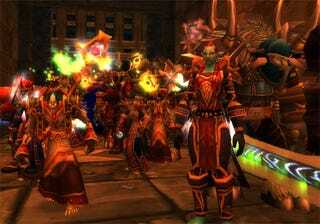 In October of 2008, Blizzard proudly counted 11 million World of Warcraft subscribers worldwide. In December 2008 the number jumped to 11.5. Now Blizzard updates the count to 12 million, 22 months later. What took so long? We can likely blame China for the slow buildup. Last year Blizzard and its partners were plagued with problems in the country. The game was down for an extended period of time when Blizzard swapped operators from The9 to NetEase. Later in the year the game was shut down for an extended period due to violations of the country's national regulations. Then, due to censorship issues, the Wrath of the Lich King expansion was delayed, finally approved for release in August. Now everything is operating at peak efficiency once more, and Blizzard can go back to tallying those numbers. That definition has remained in place since the 11.5 million count in 2008. So what happens next? With the release of the World of Warcraft: Cataclysm expansion right around the corner completely revamping the old world, I'd say Blizzard is in for a sharp jump in subscriber numbers come December.